Lutein is an important carotenoid present in vegetables (especially Kale, Broccoli, Brussel Sprouts and Spinach) and blood serum. Lutein is especially important to relieve eye disorders, such as Macular Degeneration and cataracts. 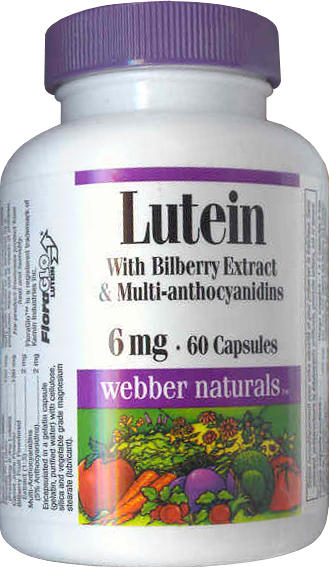 Lutein is deposited specifically in the macula of the eye, and its role postulated to prevent photo-oxidation. Macular Degeneration is the leading cause of blindness in adults over the age of 40 years old, for which there is no cure or treatment. Lutein consumption has also been associated with support for heart health possibly due to its anti-oxidant ability and concentration of these carotenoids in these body tissues, even during diseased states. Suggested Usage: 1 to 2 capsules twice daily with meals or as directed by a physician. Keep out of reach of children. Encapsulated in a gelatin capsule (gelatin, purified water) with cellulose, silica, and vegetable grade magnesium stearate (lubricant).